Sometimes it’s the simple things we share with our children that have the most dramatic impact on their lives. Prior to and for a few years after the birth of our daughter, my husband and I were avid gardeners. Back in the early 70’s we faithfully read Rodale’s Organic Gardening and applied the lessons learned. We planted a wide variety of vegetables in the garden at our home and maintained an additional plot at a community site, specifically for growing corn. A move overseas followed by years of Florida living ended our gardening adventures. Our daughter grew up to be a confirmed urban dweller. She prefers the city to a more laid back country atmosphere. She surprised us two years ago when she shared that, along with a few friends, she had ventured into canning. 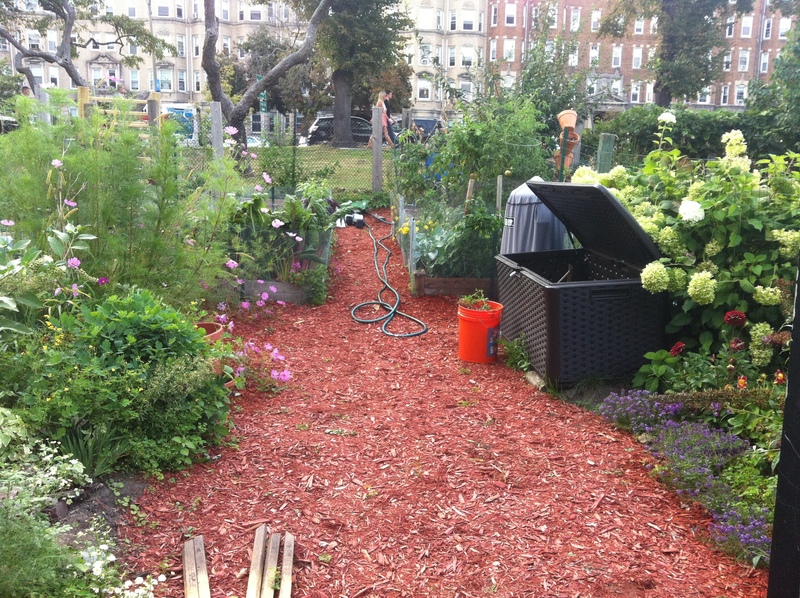 Last summer she and her husband took the next step and secured a plot in one of Boston’s communal garden sites. Next, a request came for any canning supplies still in storage. We packed up our thirty-something year-old Victorio Strainer and sent it off to serve the next generation of family gardeners. She was ecstatic, and our old friend got a new lease on life. Patriot’s Day is a state holiday in Massachusetts. It also marks the running of the Boston Marathon and the unofficial beginning of the gardening season. My daughter’s usual routine was to grab breakfast and head to the finish line to cheer the wheelchair and elite racers. Last year she called us all excited. “Turn on the TV and find the race coverage. I’m on the Jumbotron at the finish line.” We scrambled and searched sports channels and internet feeds, but alas, we missed her debut on the big screen. This year, instead of being at “their spot” at the finish line, my daughter was at the garden. When I called to check on her, I was unprepared for the sound of her tearful, frightened voice. She couldn’t reach her husband. Her calls to his phone went to voicemail. She didn’t know if he had gone to the race, but if he had, he would have been at “their spot,” the scene of the first bomb explosion. My heart sank. Thoughts of “what if” bombarded my mind. Fear attempted to grip my soul. Suddenly her voice changed. A text from her husband confirmed he was at home safe and sound. For our family, the day had a happier ending. As a mother I can’t imagine the pain of losing a child. Our son-in-love is the son we never had. To lose him would’ve devastated all of us. Daily we pray angelic protection around them both, and the angels did their jobs that day. I wouldn’t have guessed that the seeds of gardening planted in our daughter’s life so long ago would bloom and not only produce a second generation of gardeners, but also one day save her life.